Bobbi Angell is a professional botanical illustrator, whose name is extremely well known within the botanical art and illustration community within the USA - but maybe less well known in other parts of the world. Like most professional botanical illustrators, her monochrome images are typically created from herbarium specimens, pickled flowers, photographs and field sketches - and are widely published in scientific publications. The books were published 30 years apart in 1986 and 2016. I've got a used copy of her first book (that's my copy in the banner!) and ordered a brand new copy of her new book and both are valuable items on my botanical art bookshelves. In 1978 Bobbi Angell graduated from the University of Vermont with a degree in botany. She has been a freelance professional botanical illustrator ever since and illustrated more than 2,000 species. ​She has drawn scientific illustrations of plants for publication, for the botanists of the New York Botanical Garden and many other academic institutions around the world. Her work has been published in including Orchid Flora of the Greater Antilles, International Flora, Vines of Puerto Rico, and Guide to the Vascular Plants of Central French Guiana. Her drawings have also illustrated more popular books, articles and other publications for gardeners. She also illustrated The New York Times “Garden Q&A” column. When not pursuing the 'day job' she also produces very beautiful botanical fine art print using copper engraving. She is a member of the American Society of Botanical artists and New England Society of Botanical Artists. ​Her artwork is held in collections including: The New York Botanical Garden, Hunt Institute for Botanical Documentation, Shirley Sherwood Collection,and Brooklyn Botanical Garden Florilegium. 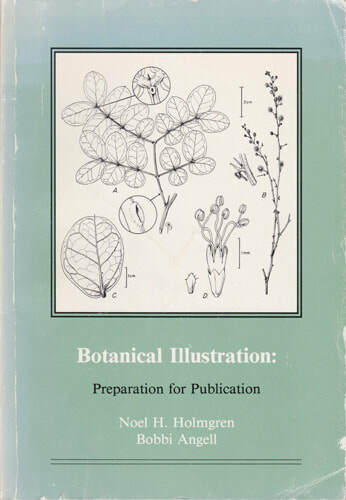 This is a unique technical manual - an instruction and reference book for professional botanical illustrators preparing illustrations for publication. It might be summarised as a "how to guide for drawing plants for publication". However it was published in 1986 - more than 30 years ago! It may be out of date - in that it doesn't cover digital techniques for producing botanical illustrations or the latest publishing methods - however, in terms of classic approaches to producing botanical illustrations for publication, this is probably one of the best reference books for botanical illustrators ever produced. I'd heard it was very good and got it out of interest and found it contained much of interest to the contemporary botanical illustrator. ​The discussion of different tools, materials and their uses alone would make it a valuable addition to the library of a serious botanical artist. CAUTION! You may have to look long and hard for a reasonably priced copy. Importing from the USA may seem like a reasonable proposition! Her co-author was Dr. Noel Holmgren who was associated with The New York Botanical Garden for over 50 years, first as a graduate student, then as Curator (at the time of the book), and finally Senior Curator Emeritus (retired 2005). He was also Chairman of The New York Botanical Garden Scientific Publications Committee. 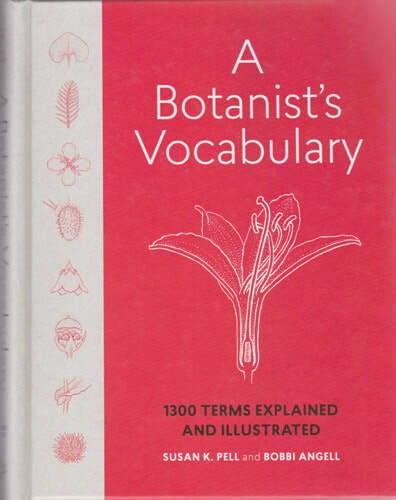 This book explains 1300 botanical terms and illustrates these using Bobbi Angell's impeccable pen and ink botanical illustrations. Terms are organised alphabetically - so if you come across one you don't know it's easy to look it up. They most relate to plants structures i.e. what the botanical illustrator observes and represents. They also include synonyms and antonyms. Botanical illustrators need to understand the different terms that botanists, naturalists and gardeners use to explain different features of a plant. However, even if you've already got a dictionary of botanical terms, this book is worth getting to receive an education in the botanical illustration of different parts plants in pen and ink by an artist who is an expert, extremely experienced and much published in a wide variety of scholarly publications! ​Students looking for a reference text for botanical terms AND developing monochrome illustrations will find it invaluable. Her co-author was Susan K. Pell, Ph.D., former Director of Science at the Brooklyn Botanic Garden, is the Deputy Director and Science and Public Programs Manager at the United States Botanic Garden in Washington, D.C.
Bobbi Angell creates richly detailed pen and ink drawings for botanists at the New York Botanical Garden and other institutions, and for many years illustrated the New York Times Garden Q&A column. A gardener and printmaker as well as an illustrator, she lives in southern Vermont.